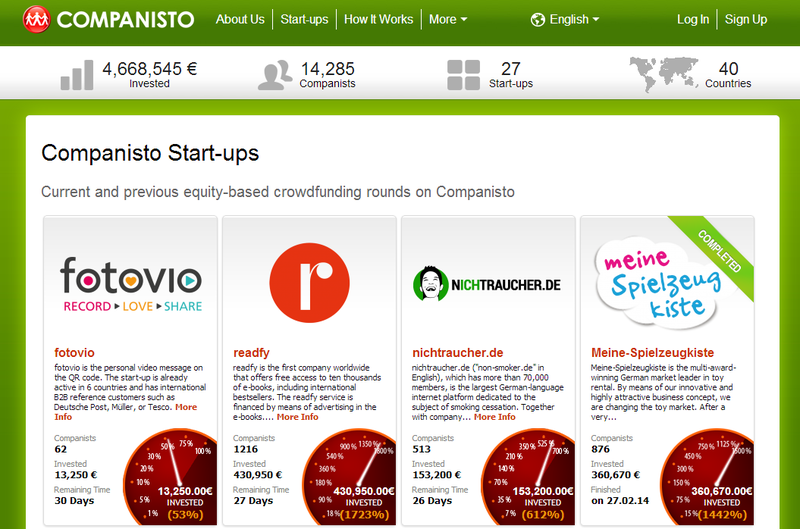 Equity-based crowdfunding company Companisto has announced the launch of a new pan-European platform where startups can present their ideas in exchange for a slice of their business. Announced today, the platform allows submissions from any business based in Europe but allows investment from anywhere in the world, providing the largest possible pool of backers. Like other non-equity based platforms like Kickstarter or Indiegogo, businesses are expected to put up a detailed presentation, video and financial projections to lure in potential investors. However, unlike alternative options, the amount of money a project can raise is unlimited, while the minimum backing starts from just €5. In exchange for an investment, equity-holders are entitled to a share of profits, as well as potentially benefiting from an exit, Companisto said. Before now, the platform was restricted to the German-speaking market and had seen more than 15,600 investments totalling more than €4.5 million. It seems like getting your project accepted onto the platform is the first challenge; Companisto said that more than 1,000 startups have applied to date, but only 25 have made it through the selection process.